The few frequent readers of this blog most likely know that i’m slightly obsessed with finding a yet discovered Warhol record cover or dust jacket. Though still highly unlikely regardless of what area i think my chances to succeed are best when it comes to the books. It’s hard to know where to start though, and it requires a lot of time at Googles image seach. Perhaps to much time i suppose. Anyways, since there’s a couple of different publishers to chose from i decided to start with the most frequent one – Doubleday. For some reason i started looking for images from the Dolphin Books imprint thing where both The Red and the Black and Manon Lescaut were published. Even though i found quite a few images of books not many sparked my interest. I’m by no means an expert on Warhol’s style but i’m slowly learning as time goes by. 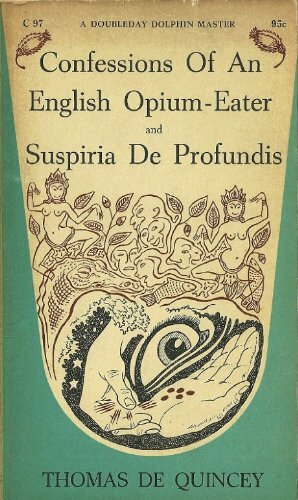 The only one i could find that really made me have a second look was this one here with the simple and easy to remember title of Confessions of an English Opium-Eater and Suspiria De Profundis. Even though it felt wrong in almost every way i saw some hands and other small drawings. And just hands alone can sometimes be enough to justify a closer look. But nah, not this time. This is definitely not the big break i was looking and hoping for. So where to go next? I really enjoy the jackets that Warhol did for the books in the Crime Club series published by Doubleday so why not go there and see if there are any clues… The known ones so far are The Saint in Europe, The Runaway Pigeon and Pistols For Two. I had a feeling this was popular publication at the time but i must admit i had no idea exactly how popular it was. 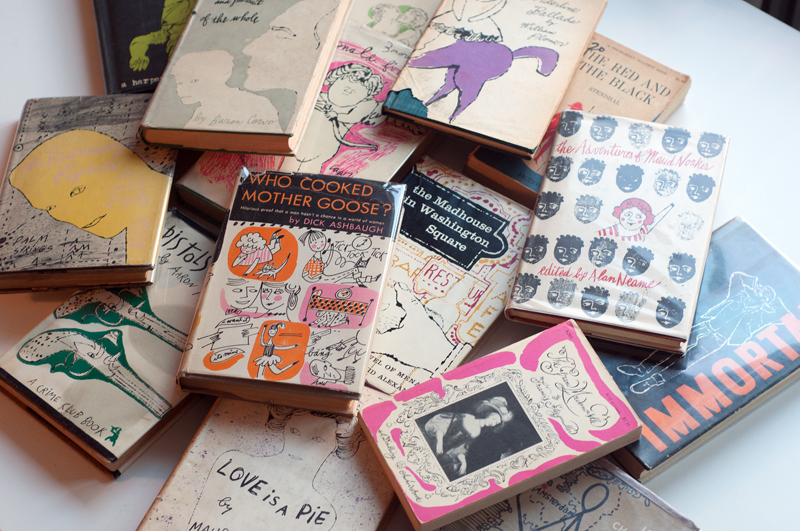 For over 60 years Doubleday published almost 2500 titles, 2492 to be exact. Perhaps most famous (not to me though) are the 50 books of The Saint by Leslie Charteris where Warhol did the cover to one of them – The Saint in Europe published in 1953. And with this bulk of books to go through it’s safe to say i’ve got my work cut out for me should i decide to take on this task. 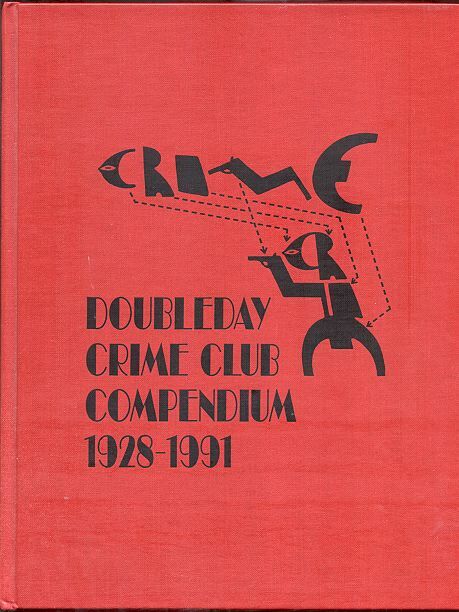 I’ve also found a book that might be quintessential in taking on this task and it’s this one titled Doubleday Crime Club Compendium 1928-1991 by Ellen Nehr. I doubt the book has images of all 2492 books in the series, or maybe it does. But i’ve at least figuered out that it does, perhaps obviously, contain a complete record of all titles and authors. Impressive work… But with a lowest possible price tag of $125 at the moment i might have to settle for Googles image search. It was also with the help of the cover to this “compendium book” that i understood that the logo was actually made up of the letters in “C R I M E”. To me the logo has always been a strange looking guy pointing a gun at someone. But now i see that it could also be a man falling head first and with arms raised to maybe try and break his fall, a very clever and cool design! This has nothing to do with Warhol but i’ve also learned that a number or stories from the books were used as basis for two runs of radio shows in the 30’s and 40’s. The first of these was called The Eno Crime Club and broadcast on CBS, and the second was called simply The Crime Club and broadcast on the Mutual Broadcasting System. The episodes of this last run is available to listen to at this site. And then in the late 30’s when radio apparently wasn’t enough Universal and Doubleday reached a deal for 11 mystery films based on books in the series. Oh, i almost forgot the coolest thing i read about the Crime Club. Besides the dust jackets by Warhol of course. Anyways, sometime in the mid 30’s they, together with Einson-Freeman, started to produce jigsaw puzzles that were sold together with an original crime story with an open/unresolved ending. Then solving the puzzle gave clues that were needed to figure out the mystery from the book. Such a great and cool concept! Apparently there were three of these things sold – The Torch Murder, The Death Safe and The Ringer’s Revenge. All seem to be very rare and highly sought after by collectors. I found one on AbeBooks and a complete set is at $300 whereas just the box with he puzzle will put you back $175. I wonder what one of these with a puzzle and/or dust jacket designed by Warhol would be priced at?